Go to original pattern for design DROPS 65-23. DROPS Shawl in Italian Velvet. Width uppermost: approx. 2 meters. Length at the center back: approx. 110 cm. Materials: DROPS Italian Velvet, 62% polyakryl, 38% polyester, 100 g = approx. 55 sts. 700 g col. no. 02, plum. 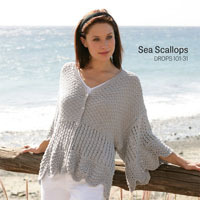 DROPS Circular needles size 15. 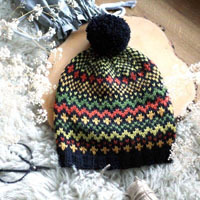 Gauge: 6 sts x 11 rows on needles size 15 and pattern knitting = 10 x 10 cm [4" x 4"]. round 1: K 1, yo, K 1, yo, K 1 = 5 sts. round 2: K 1, P 1, yo, P 2 tog, yo, K 1 = 6 sts. round 3: K 1, yo, K 2 tog, yo, K 2 tog, yo, K 1 = 7 sts. round 4: K 1, yo, P 2 tog, yo, P 2 tog, yo, P 1, K 1 = 8 sts. round 5: K 2, yo, K 2 tog, yo, K 2 tog, yo, 2 sts of garter st = 9 sts. round 6: K 1, P 1, yo, P 2 tog, yo, P 2 tog, yo, P 2 tog, yo, K 1 = 10 sts. 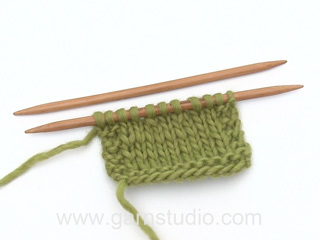 round 7: K 1, yo, * K 2 tog, yo *, repeat from *-* until 1 st remains on the needles, knit this st as garter st = 11 sts. round 8: K 1, yo, * P 2 tog, yo *, repeat from *-* until 2 sts remain on the needles, P 1, K 1 = 12 sts. round 9: K 2, yo, * K 2 tog, yo *, repeat from *-* until 2 sts remain on the needles, knit these as garter st = 13 sts. 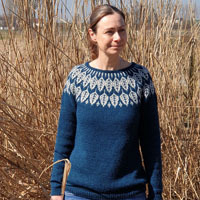 round 10: K 1, P 1, yo, * P 2 tog, yo *, repeat *-* until 1 st remains on the needles, knit this st as garter st = 14 sts. Repeat rounds 7 to 10 upwards. With this pattern 1 st is increased every row. 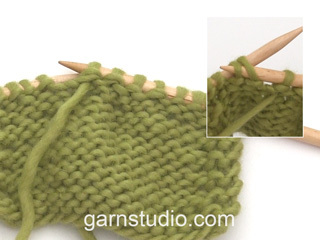 When there are 120 sts on the needles (or when the desired measurements have been reached) bind off with double yarn. 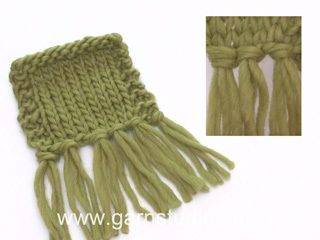 Fringes: Attach fringes along both diagonal edges of the shawl with 5-cm intervals. 1 fringe = 2 strands 25 cm in length - pull the doubled strands through 1 edge st and draw the ends through the loop («eye»). 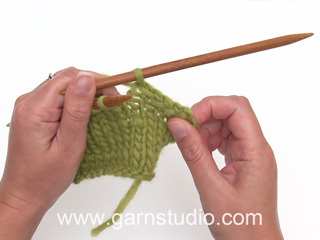 Tie a knot outermost in each end of the yarn so that the strands do not divide apart. Dear Amber, there are no mistakes in the 3rd row: are you sure to end up the 2nd row with 6 sts? Do you have a yo between the two middle P sts? Happy knitting! Die einzige Garnalternative ist Polaris aber die hat nicht den selben effekt. Welche Wolle kann man denn dafür noch benutzen um so einen Umschlag noch zu machen? Natalia - we have discovered that this is an error. There IS NO CHART for 65 - 23. The little red box in the Pattern Description should not have been there - and I believe, has now been removed. Sorry for the confusion. That's correct, Natalia - I have written an e-mail to Garnstudio to have them correct that on their website. I had hoped to be able to advise you to retrieve the Diagram from the Norwegian site - but that also is not visible. As there is no-one at Garnstudio until Monday, this will not be corrected until then. Thankyou for letting us know.